Recently I once again ventured with my children into the realm of 3D movies to see the latest Shrek offering. My 8 year old daughter, being a Shrek fan, was keen to go. My 4 year old son threatened mutiny all the way to the cinema. This time round he did not poke out the lens of the 3D glasses – mainly because he had lost them before we had even settled into our seats. But despite the minor dramas at the start, we all thoroughly enjoyed this movie though no doubt for different reasons and at different levels. Like the last 2 sequels, the story begins where most fairy tales finish – in the “they lived happily ever after”. Shrek (Mike Myers) and Fiona (Cameron Diaz), with their cute and boisterous year old triplets, are comfortably ensconced in Shrek’s old home in the Swamp. At first Shrek is happy but as idyllic day follows day, the predictability, responsibilities, and expectations of family life begin to crowd out its simple joys. The lack of privacy and personal intrusion that result from being a prime tourist attraction only compounds the problem. Things come to a climatic head on the day of the triplets’ first birthday party. The demands of being the host, the antics of well meaning but interfering friends, Fiona’s rapid fire directions and the final straw of the persistent requests of an obnoxious boy for Shrek to “roar” like a trained circus performer results in an angry outburst. In the more private fiery confrontation with Fiona that follows Shrek blurts out “I wish things were how they were before I rescued you.” He watches the hurt, anger and bafflement in her eyes before she turns away from him to return to the party. Angry with himself and frustrated at how things are, he stomps off home. The rift provides a perfect opportunity for Rumplestiltskin (Walt Dohm) – who had seen the whole thing while rifling amongst the rubbish bins. Craftily arranging an encounter with Shrek, Rumple persuades him to sign one of his infamous contracts, to exchange a day of freedom from family responsibilities in which Shrek can be a real ogre again in return for a day in his childhood – a day he would not remember, when he was but a mindless infant, a day that surely Shrek would never miss. And so it at first appears. Shrek revels in being the terror of the all and sundry – until he realises that there something drastically wrong with the world. For this is a parallel world in which Rumple with the help of his witch cronies rules as a tyrant, in which donkey (Eddie Murphy) does not know him, in which he and Fiona have never met and in which his own future is under the gravest threat. The only way to save both the future and the past is for Shrek and Fiona to fall in love all over again – something that only happens as he begins to see things from her point of view. This fourth movie as funny and original as the others – with the characters we have grown to love and laugh at as well as some new ones. While the ending is never really in doubt, there are some ingenious twists and turns to get there. The 3D presentation enhances the film, particularly the flying scenes, without getting in the way of the story which is carried by the characters, plot and humour. Once again, the usual fairy tale clichés and platitudes are turned upside down. In this case, the myth (often perpetuated in Hollywood) debunked is that once the hero and heroine have overcome all obstacles to prove their true love, they live happily ever after. In each of the sequels, Fiona and Shrek continue to face challenges in their relationship after their initial (unconventional) fairy tale union. 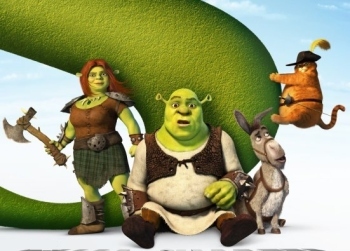 In this movie Shrek’s love for Fiona is being smothered by the reality of the responsibilities and tensions of being a husband, father and responsible member of the community. Feelings of love and romance fade as Shrek longs nostalgically for the old days when his life was simple, he had no responsibilities and he was taken seriously. It is only when he realises that he will lose it all that he realises how important the love of his wife, children – even irritating friends like donkey – are to him. It is not just romance novels that push the idea that once we find “true love” – the one, true, perfect match meant for us alone – we will live happily ever after. We may not admit it, but we often believe that heady feeling of romance will last forever. And when it begins to fade, the things that first attracted us to our partner begin to annoy and frustrate us. We begin to wonder if we have made a grave mistake. Suddenly, the grass starts looking much greener next door. Surely, we think, moving out and moving on will solve all. Forever After reminds us that true love – a love that lasts – is not something that falls from the sky. While romantic feelings often come and go, lasting relationships require work and commitment. True love flourishes when we deeply care for and respect our partner for who they are (not for what we wish they might be), when we remain committed to them despite the bumps in the road, when we work at clear, loving and truthful communication and when we make time to rekindle the romance in the midst of the other demands of life. Our partner may not be perfect – our image of Prince (or Princess) Charming – but neither are we. True love may not fall out of the heavens, but it is truly heavenly – for it is God who shows us what true love is. Forever After is a great movie to take the kids along to – they will love the humour and crazy situations Shrek, Fiona, Donkey, Puss in Boots and the others find themselves in. Yet in many ways it speaks more to the mums and dads who may have lost sight of themselves and their partners amidst the multiple demands of family life.